Into Eternity was born as a progressive, melodic death metal band in Regina, Saskatchewan, Canada somewhere in the late nineties of the past century. It all started with founder and guitarist and vocalist Tim Roth, who remains a member up to this day, which is no small feat nowadays. Through the years the band was recognized as one of the most acclaimed bands in metal, although that is a questionable title, because you’re usually considered to be only as good as your latest release. The line-up underwent quite some changes during the band’s existence, but for the past four years things seem to be stable. Tim has gathered a line-up along his side that consists of Matt Cuthbertson on guitar, Troy Bleich as bassist/vocalist, Bryan Newbury on drums and, last but not least, Amanda Kiernan as vocalist who is now the permanent lead singer after initially being hired to replace Stu Block while he was on tour with Iced Earth. The first years of its existence Into Eternity was quite productive, releasing five full-lengths in nine years. After that the band took some sweet time to conjure up their sixth, about a decade to be precise. The last feat of arms has been The Incurable Tragedy, back in 2008, which received remarkably mixed critics. Coincidence or not, three of the five current members, Matt, Bryan and Amanda, weren’t part of the band at that time and the majority of the most criticized parts of The Incurable Tragedy were performed by their predecessors. Considering this and the fact the band appeared to have disappeared into nothingness for a very long time, one might expect they took their critics’ comments to heart. Until now, when they’re getting ready to release their latest full-length called The Sirens. 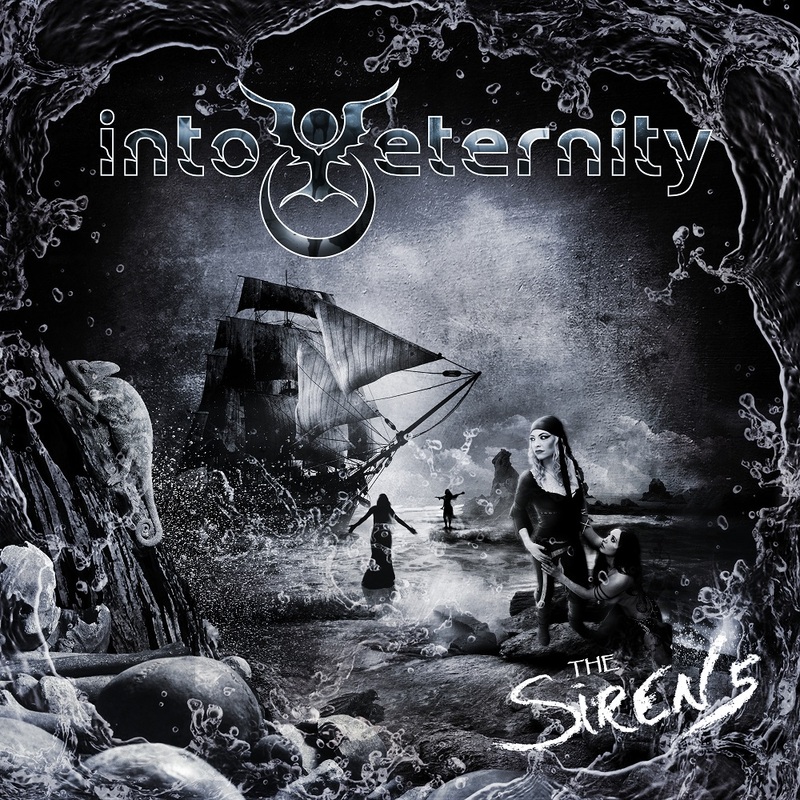 The Sirens brings us eight songs of technical, highly complicated metal which taps from about every metal genre imaginable, spanning a total of fifty minutes. In all honesty, this is not an album you’re going to play as background music or simply as a pass-time. If you decide to give this a spin, make damn’ sure it has you full and undivided attention at all times, because its tunes are very unforgiving towards wandering off or losing focus. The sheer complexity of the majority of the songs makes it impossible to describe them accurately, which leaves you no other option than simply play this. Or not. Heavily emphasizing progressive metal, there is so much variety and so many changes in speed, rhythm, vocal style and every other aspect you can think of, it’s hard to keep up with the songs at times and stay focused. And that right there might be Into Eternity’s biggest weakness. In order to fully comprehend the tunes you have to keep focused at any given moment, but it’s hard to do so because of the complexity of said tunes. The guitars alternate between heavy, dark, moody pieces and powerful, clear, restless intermezzos with the speed of light, changing the atmosphere of the tracks in an equally swift fashion. The solos are at times definite rhythm breakers and sometimes seem improvident and randomly placed in the song, but then again, this still IS prog we are listening to. If anything there’s plenty of speed throughout, especially in the solos. Overall they did a great job. The drummer did a good job as well, although he goes a bit overboard at times, trying to outpace his own speed. There’s no denying he is fast and capable, as goes for the other members as well, but sometimes it feels he is just showing off his speed rather than being the crucial backbone of a song. This of course is not due to him being a showoff, but is hidden in the composition of the song. The poor bassist has to keep up with all this musical violence, having to both support the drum line and guarding the song structure. Luckily he is more than up for that task, although he is pushed into the background of the mix a bit too far in my opinion. The lyrical concept is dark and gloomy enough to push away every last bit of pleasure you might still feel in your mind, dealing with subjects like sarcopenia, psychosis and oblivion. Having said that, the actual lyrics are a bit too simple to make a serious impact, they seem more like random lines and words related to a particular subject, leaving a lot of room for interpretation. I might give the band an escape route here, but if this was intentionally done, it’s not a bad idea in itself. I can imagine, but I am still guessing here, they did this on purpose to let the very complicated music lead your thoughts about the subjects. Either way, I for one prefer a bit more intricate lyrics, these feel a bit superficial, but it’s not a huge problem. The vocals range from foul grunts via mean, low screams with a mild black metal vibe to power-metal-pitched cries and everything in between and are pretty good, which is to be expected when you get to pick between three different vocalists. Like in all other layers of the music here too the band made choices I might not have, but still they seem fitting pretty well, so there again is no hard evidence what they did was wrong. Concluding I have to say that this is an album that is in no way easily accessible. Is that a problem? Well, yes and no. Yes, it is a problem because it will limit the amount of people that will really like this album, mostly due to its complicated and somewhat improvident feel in the overall composition of the songs. It takes a specific type of music fan to thoroughly enjoy this. But no, it’s not a problem, because it’s a one-of-a-kind album that, when given time and space, will unleash its full potential on the listener, which is considerable. It’s not perfect, as you have read it has its flaws, but then again, who has ever heard a perfect album? It most definitely is better than its predecessor, way better even, so if that is holding you back from trying this you need not worry. If this piqued your interest, make sure to try it and the same goes for people who enjoy complicated, highly varying music. Just make sure you give it a fair chance, one spin simply won’t do.